Green Bay Packers head coach Mike McCarthy insists Aaron Rodgers is "getting better", but that the quarterback remains "day to day" due to his leg injury. 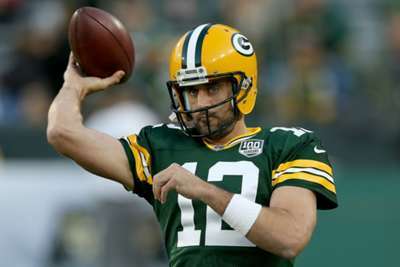 Rodgers, 34, injured his leg in the first half of the Packers’ 24-23 win against the Chicago Bears last weekend. The quarterback returned to the game and led a remarkable comeback from 20-3 down, but he did not participate in Green Bay's practices on Wednesday and Thursday. McCarthy spoke with reporters on Friday and conceded Rodgers' status for his team's Week 2 game against the Minnesota Vikings remains up in the air. "Aaron's getting better," McCarthy said in quotes published on the Packers' website. "I would say he feels better than he did at the beginning of the week. Tomorrow's [Saturday] practice will be a big indicator. Nothing's changed, he's still day-to-day." McCarthy added that Rodgers could play in the game even if he does not receive any practice reps.
"We've established that point some time ago in his career," McCarthy said. "You'd like to walk off the field Saturday and have your plan set, but this is the NFL. Things happen. We'll be ready for anything. I know he wants to play. We'll see how it goes."